This product has strong historical links with BioConnections. Now the medium of choice for the routine isolation of clinically significant anaerobes, our medium supports the growth of most fastidious anaerobes. Classical colony formation, odour and fluorescence under UV are diagnostic features on this medium. The choice of peptones and growth factors provide early growth of most organisms whilst the starch has an important role as a de-toxification agent. The medium is often made selective for various groups of anaerobes by the addition of appropriate selective agents. 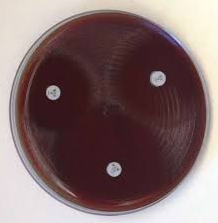 At ECCMID 2018 a poster was presented outlining the work towards the development of a EUCAST disk diffusion method for rapidly growing anaerobic bacteria using fastidious anaerobe agar (FAA). We also ship in 2.5 kilo amounts direct to manufacturers of ready to use media in the UK and throughout Europe..
​Suspend 45.6 grams of powder in 1 litre of deionised water. Autoclave at 121C for 15 minutes. Cool to 48C and add 5-7% of sterile defibrinated horse or sheep blood. ​Mix well by swirling and pour into 90mm petri dishes. (Optional – The medium may be made selective by addition of antibiotic supplements.) Appearance: Dependant upon the oxygenation level of the added blood. Should not show signs of haemolysis. More information? How can we help?